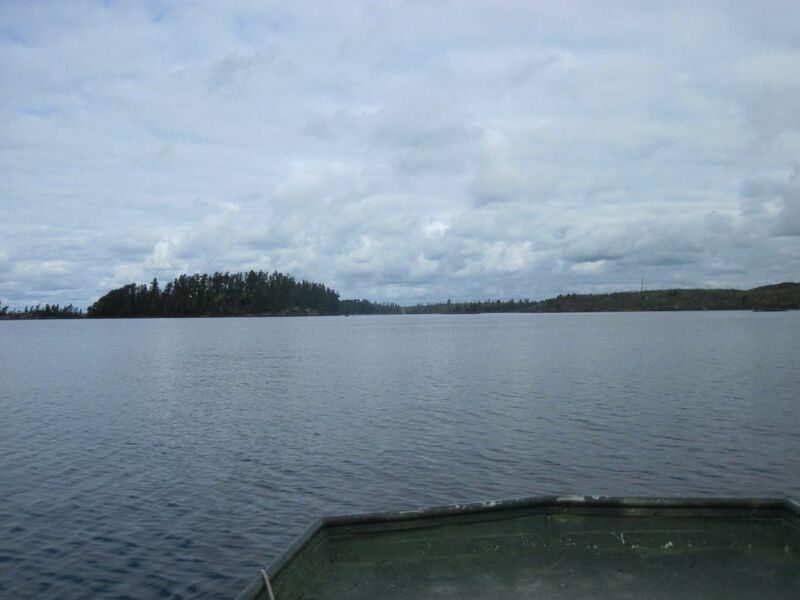 We love sharing our personal and our guests’ trip reports from canoe trips in the Boundary Waters Canoe Area Wilderness and Quetico Provincial Park. Last June, I was able to sneak out for an afternoon day trip on the Snipe Lake Loop with my brother and sister-in-law when they were up. This short Boundary Waters Canoe Area Wilderness canoe route basically loops through Tuscarora’s backyard. We frequently send cabin guests and a handful of overnight campers on this route because it’s convenient, scenic, and provides an excellent introduction to the BWCA. It was a glorious sunny day, so we grabbed a three-person Kevlar canoe and off we went . . . .
As the name “loop” implies, this route can be done in two directions, either starting on our beach on Round Lake, or just down the Round Lake Road (County Road 47) at the public put-in for Cross Bay Lake. The three of us opted to start at Tuscarora for a couple reasons. Logistically, it was just easier to start at the beach since our canoes are right there and we didn’t have to monkey around with shuttling ourselves and canoe down the road . . . even if it is only 300 yards away from the outfitting building. I also liked the idea of getting the two longer portages done first thing (the portage from Round to Missing Link is 142 rods and the portage from Missing Link to Snipe is 180 rods), although by doing the route in the counterclockwise direction, we of course had more uphill portaging . . . . Clearly, a compelling argument can be made for doing the loop in either direction. It was a mid-week afternoon in late June and the woods were still pretty quiet. We ran into a group coming across the Missing Link portage, then passed a large group on the first campsite on Missing Link. From then on, we had the woods to ourselves. One of the nice things about doing the Snipe Lake Loop with three people in a three-person canoe is that it’s easy to navigate the single biggest challenge on the entire six-mile route. About a quarter of a mile down the portage between Missing Link and Snipe Lake, you come to a large boulder that slopes down into a ravine. It’s only about a seven foot dip, but it can be a bit of a poser on how to tackle it when you come to this “valley” with a canoe on your shoulders. If you’re traveling by yourself or just one other person, the only real option is to set the canoe down, get yourself down the rock face, then collect the canoe and carry on. My brother Peter was portaging the canoe when we reached this point, so his wife Ashley and I just grabbed the two ends of the canoe and held it up while Peter walk out from under the canoe and down the rock face. Once he was on level footing again, we just set it back down on his shoulders and continued on to beautiful Snipe Lake. Snipe Lake really is a gem. Even though you’re only a couple miles into the BWCA, it feels like you’re deep in the wilderness. It has dramatic rock features, twisty canyons, and lush forest. It’s not a great lake for fishing (it just has small northerns) but with four campsites and not a lot of traffic, it’s a good option for people who want to feel like they’re in the remote wilderness without actually traveling very far. That said, there’s some debate about whether the Snipe Lake Loop is “easy.” Because of its convenient location, many Tuscarora guests get their first taste of the Boundary Waters on the Snipe Loop. It’s not the easiest Boundary Waters canoe route in the world, but it has several factors that push it into the “easier” category, namely that you only travel six miles to complete the whole loop meaning it can be done in about three and a half hours of continuous paddling and portaging. It’s also only on small bodies of water so you don’t have to worry too much about wind conditions. While two of the portages are longer, all of the portages are well traveled and well maintained. But every Boundary Waters trip inherently challenging on some level and even the easiest BWCA trip isn’t a walk in the park. (I actually wrote a whole blog post about the Boundary Waters not being a park a couple years ago.) As you can see in the photo above, the portages can be mucky. On Cross Bay Lake, the person in the bow needs to watch in front of them so the canoe doesn’t get hung up on the bottom or rocks as you paddle the shallow areas near the portages. When you take off on Cross Bay Lake from the Snipe portage, you meander down a shallow, twisty waterway about creek-width. Be sure to watch for blooming pitcher plants if you’re paddling through in early summer. We literally saw hundreds of these carnivorous flowers in bloom as we paddled by – the most I’ve ever seen in one location. 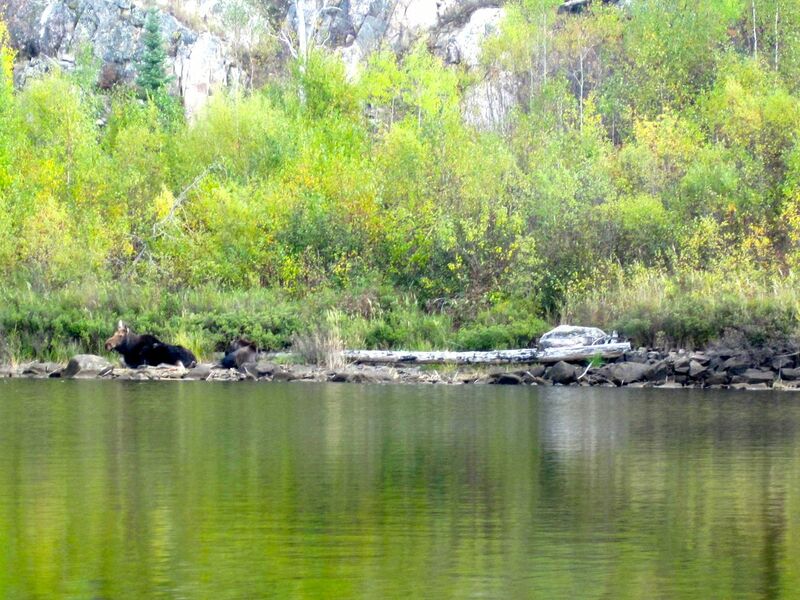 Although we didn’t see one on this trip, Cross Bay Lake is also know to be a bit of a moose viewing hot spot. 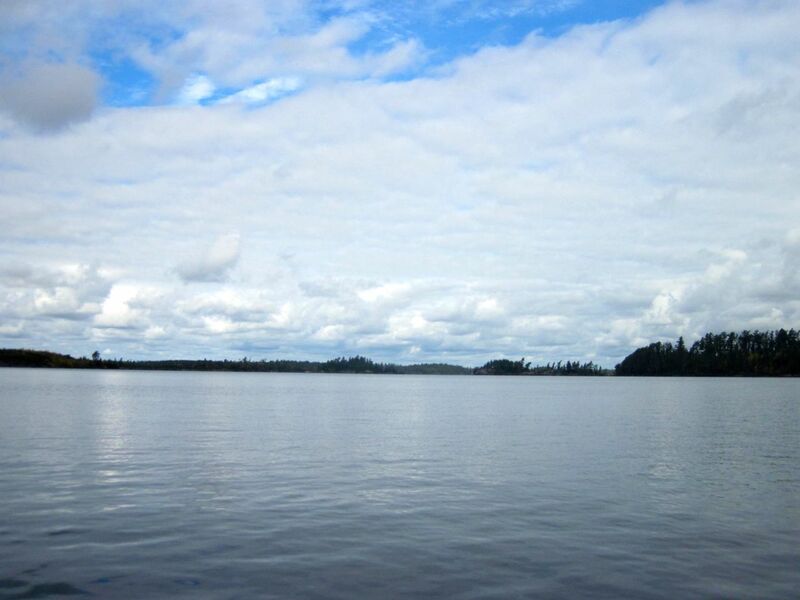 As you portage from Cross Bay Lake into Ham Lake, you’ll exit the Boundary Waters. You still have two portages to go to reach the public landing though. Ham Lake is completely outside of the Boundary Waters Canoe Area Wilderness, but still in the Superior National Forest. That means the four campsites on this lake are “dispersed sites” aka first come, first serve campsites that don’t require an overnight permit (or camping fee) to camp here. As a result, this lake can be pretty busy in the Boundary Waters high season (late July – mid August) when Boundary Waters permit quotas are filled, but people are still looking to get a BWCA camping experience. It’s also a lake that people frequently camp on for the last night of their overnight trip down to Long Island Lake or beyond, because Ham Lake has a good population of walleye and bass. Despite these facts, all four campsites were empty when we paddled past. From Ham Lake, we continued on for the “portage/paddle/portage/paddle” around a couple sets of rapids on the Cross River back to the public landing. From there, we did a quick 1/3 mile walk up the road back to Tuscarora. Although we did the trip as a day trip, I could see why you’d choose this route for an overnight trip. For such a short BWCA route, it really has some great campsite options, especially if the purpose of your trip is to relax and recharge and fishing isn’t much of a priority. Have you done the Snipe Lake Loop before? As the world becomes increasingly globalized and technology makes it easier and easier to stay in touch, we’re finding that more Boundary Waters visitors than ever want a way to get in touch with the outside world in case of emergency while in the wilderness or so they can keep up on any news from home. Tuscarora’s been offering satellite phones for a few years to help people with the somewhat incongruous goals of getting away from it all and still being reachable. For most people, having a satellite phone provides a sense of security for both themselves and their loved ones, the same way having a fully stocked first aid kit provides peace of mind on the trail. Like that first aid kit, a satellite phone’s meant to be just another tool in your pack in case the unthinkable happens. Our satellite phone has a battery life of about 24 hours. This essentially makes the phone a call-out only device because it needs to be turned off for the majority of your trip to make sure it has enough “juice” to call in case of an emergency. You must be out in the open to get a signal for the phone. Satellite phones are notorious for dropped calls. Satellite phones are ‘spensive. Replacement costs are around $1300, so you really, really don’t want to accidentally drop it in the lake. 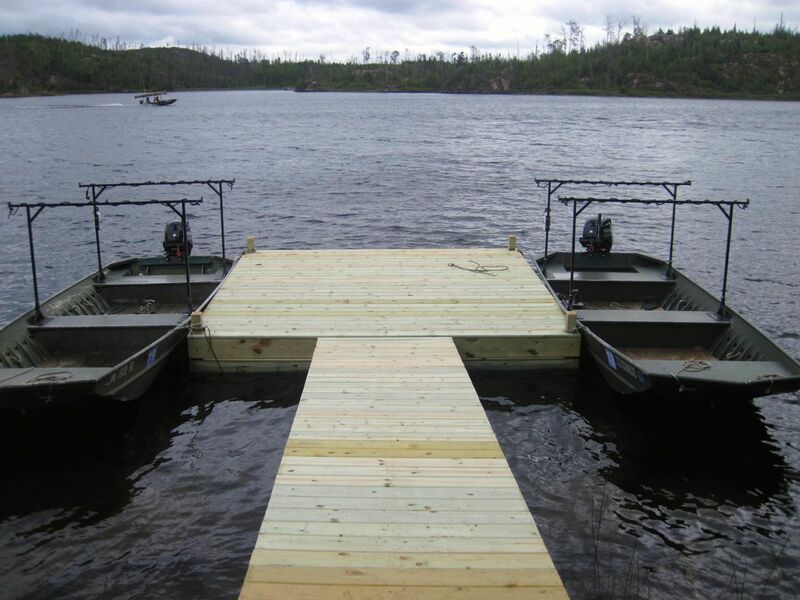 We figured there had to be a better way for people to do their canoe trips and still remain in contact. Enter the DeLorme Inreach device. A longtime time Tuscarora guest has been talking up the DeLorme Inreach device for a while and this spring we decided to give it a whirl. It’s a bit of an apples to oranges comparison to compare the Inreach to a satellite phone, since you can’t make calls with the Inreach. Rather, the Inreach is a texting device that allows you to send text messages and emails (160 character limit per message) to people back home and have two-way conversations that way. There’s no monthly limit on messages that can be sent with our plan, so you don’t have to worry about racking up a big bill, no matter how much you use it during your travels. Post your location on social media, including Facebook and Twitter. Shoot waypoints on a map. Uses a whole lot less battery than a satellite phone. You don’t want to leave it on during your entire trip, but you can use it freely without worrying about the battery dying. Is water resistant and floats. Replacement costs are around $300. A couple weeks back, Andy and his buddy Quinn decided to take advantage of this summer’s high water and paddle the Greenwood River about 30 miles southeast of Tuscarora. The Greenwood River not technically in the Boundary Waters, but it’s tucked away in some pretty remote reaches of the Superior National Forest. Arguably, you’re more likely to find assistance during an emergency when you’re in the Boundary Waters than in Greenwood country, since, more often than not, you’re on an established travel path while traveling in the BWCA. Down in Greenwood country, if you run into trouble, it’s going to be a long time before someone stumbles upon you. While no one really thought Andy and Quinn would find peril during their afternoon trip down the Greenwood, Andy threw in the Inreach to see how it would work in a wilderness situation. When we were testing out the DeLorme around Tuscarora, we found that it can take a little while for the messages to transmit if you’re not out in the open. Also, if you’re moving while the Inreach is transmitting, it can get a little confused and might send duplicate messages. However, when Andy was down at Greenwood, we were able to go back and forth with just a minute or two lag time between messages. When you open the link in the email or text sent with the Inreach, you’re brought to a map that pinpoints where the message was sent from. You reply to the Inreach sender right in the little message box on the righthand side of the screen. You can zoom in and out on the map to get a very specific location. Even if you didn’t want to message anyone during your trip, it would be kind of neat to send yourself your location so at the end of your trip you have several snapshots of your route. All in all, we’ve found the Delorme Inreach to be a viable alternative to a satellite phone. You might not be able to send or receive very detailed messages with it, but it is a good way to check in at home with a simple, “all’s well,” and with its GPS tracking capability, it’s a useful tool if you have the misfortune of ending up at the center of a search and rescue mission. It’s a device that satisfies the map geek and provides peace of mind. Currently we have one DeLorme in reach available for rental at Tuscarora and if it proves popular, we’ll make more available. If you try one out, be sure to let us know what you think. Before Andy and I took over at Tuscarora this June, the tow boat service offered by Tuscarora was one of the most fascinating aspects of the business to mull over in our minds. Food packing; cabin, bunk, and gear cleaning; even French toast cooking didn’t phase us, but motoring people around Saganaga Lake – the biggest lake in our neck of the woods – that sounded a little challenging and really fun. I’ve always meant to get to know Saganaga Lake better, but even though I spent five years working on the shore of Saganaga Lake (as the manager of Chik-Wauk Museum and Nature Center), I’d only been on Sag a handful of times. It’s one of those lakes with its own personality and unique lore and I’ve been looking forward to learning it. All summer long, Andy, staff members (including Andy’s wonderful Uncle John), and guests traveled across Saganaga Lake, getting tows to and from Hook Island, American Point, or Red Rock portage as they started and ended their Boundary Waters and Quetico canoe trips. But sometimes when you’re the boss lady, it’s hard to get out of the office long enough to check the mail, let alone go on a tow boat ride. But earlier this month, I finally made it. You couldn’t ask for a more beautiful time to be on Sag as the colors pop along the shoreline and the loons start to raft together in preparation for their migration. As we traveled up the Sag Corridor, Andy pointed out a mama moose and her calf who’d be hanging out right on the water’s edge all morning. Because the wind was pretty calm during our journey, it took us only about 20 minutes (versus about six hours of paddle time) to reach Hook Island where we were picking up a camper from his weeklong solo trip in Quetico. As we pulled into Hook Island, the sun peeped out from the low, grey clouds. Our camper was all set to go and in just a few minutes, we had his canoe up on the towboat racks and his gear loaded as we listened to tales from his trip. On the way back, we spotted the moose pair again. They looked pretty cozy and completely unperturbed by the boat passing them by. Here’s to many more tow boat adventures! Recently, my parents spent a couple nights in Cabin 2. They had a great time on the Gunflint Trail, celebrating birthdays, testing out a new Souris River canoe, swinging by the house for evening ice cream, and doing a lot of hiking. 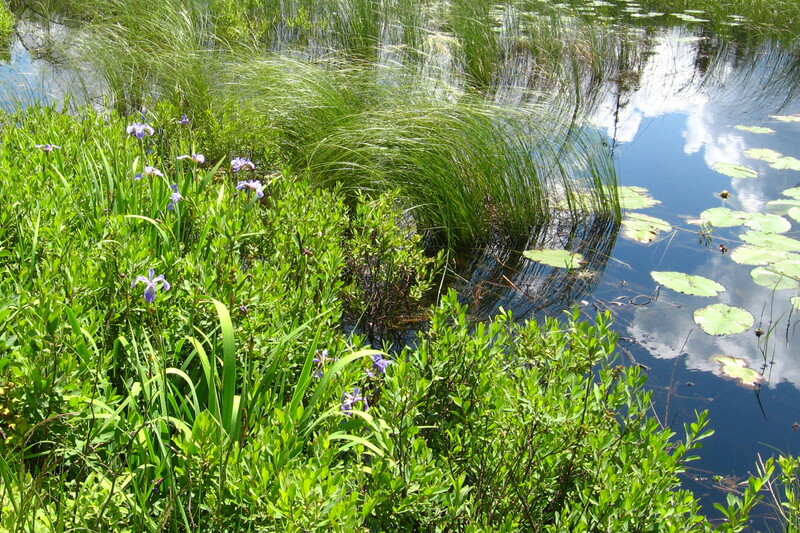 Irises in Flying Lake on their day trip into Bingshick Lake. The elusive Arethusa bulbosa orchid that prompted the day trip. 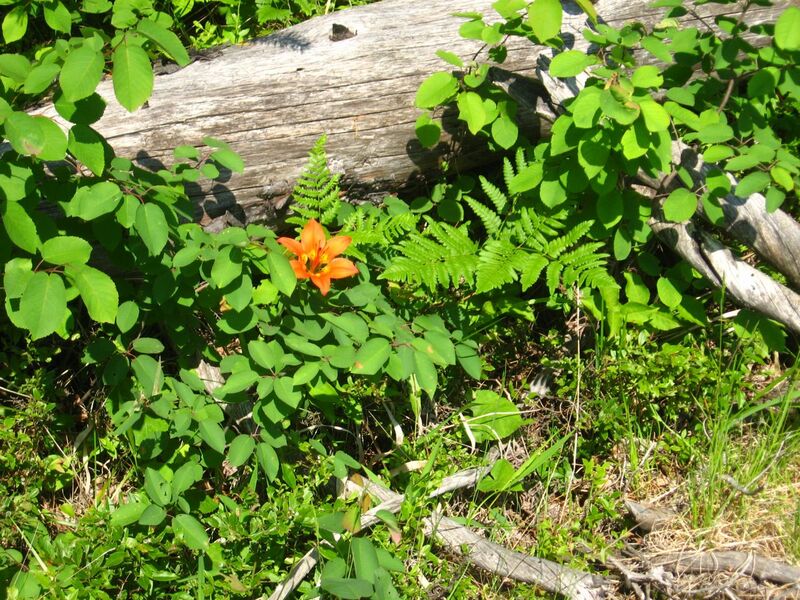 A wood lily blooming along Magnetic Rock Trail. 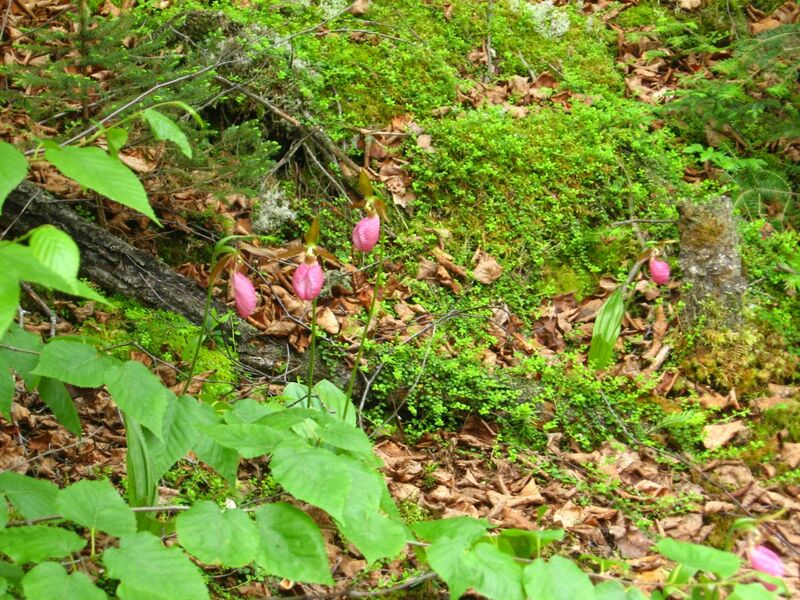 A cluster of pink moccasin flowers near the start of the B.A. Trail just outside Cabin 2. All those flowers made me smile, not just because I also greatly enjoy wildflowers, but because suddenly it was so obvious why I delight in finding wildflowers tucked among the forest duff. When we were little, my dad often took my brother and I on outdoor adventures, not only to give Mom a little peace and quiet, but so he could look for whatever wildflowers happened to be in season. An early springtime hike in search of Hepatica impressed me so much that when we returned home, I declared to my mother that if I ever had a daughter, I’d name her Hepatica and call her Patty for short. I still have a copy of Peterson First Guide to Wildflowers from that era tucked on my bookshelf. As we got older, the hikes tapered off and I started to prefer time inside with library books over chilly, mucky springtime hikes in search of teeny wildflowers, but by the time I’d graduated from college and was working at a Gunflint Trail canoe outfitters, I’d once again taken to walking along the side of the gravel roads with a wildflower guide in hand. I find great satisfaction in identifying the habitat where a plant should be growing in, looking, looking, and then, discovering the flower right where it should be. And yes, during the summer, my camera’s memory card has more wildflower photos than anything else. It’s interesting the things that end up “sticking.” Maybe you’ve brought your own children up to the Boundary Waters or tried to share your love of wildflowers or the night sky and didn’t get the unbridled enthusiasm you expected. (I certainly wasn’t above whining on some of those wildflower hikes decades ago.) It can take time to fully understand experiences. After all, it’s taken years for the significance of my childhood wildflower hikes to soak in. In the big scheme of things, all those little prompts and introductions that were initially met with apathy often add up to something that can enhance entire lives. Land of True Happiness, Canadian Wilderness! On August 8, my friends Laura, Tessa, Steph, and I set off on a wonderful, witty, wandering wilderness women’s adventure. All of us had spent summers guiding and traveling through the Boundary Waters on the US-Canada border, but this was the first time any of us had ventured north of that border on a multi-night Quetico trip. We were so excited and so ready to go (especially guide dog Avery!). A tow from Tuscarora gave us a jumpstart on our 95-mile journey. Thanks Kyle! After checking in with Janice at the Cache Bay Ranger Station, we paddled north toward the Falls Chain. It was so much fun to put “faces” with the names we’d heard so many times (Silver Falls, Saganagons, Kawnipi), to see the unique characters of the many waterfalls (Bald Rock, Koko, Four Falls, Little Falls, Canyon, Kennebas) around which we portaged. Turns out the sound of rushing water is very encouraging when you’re carrying a heavy pack and/or canoe! Although we saw several other people along the Falls Chain, by the time we turned south towards Agnes it was beginning to feel like it was just us and the Canadian wilderness. We loved the still mornings and evenings (good for sunset yoga on the rocks! 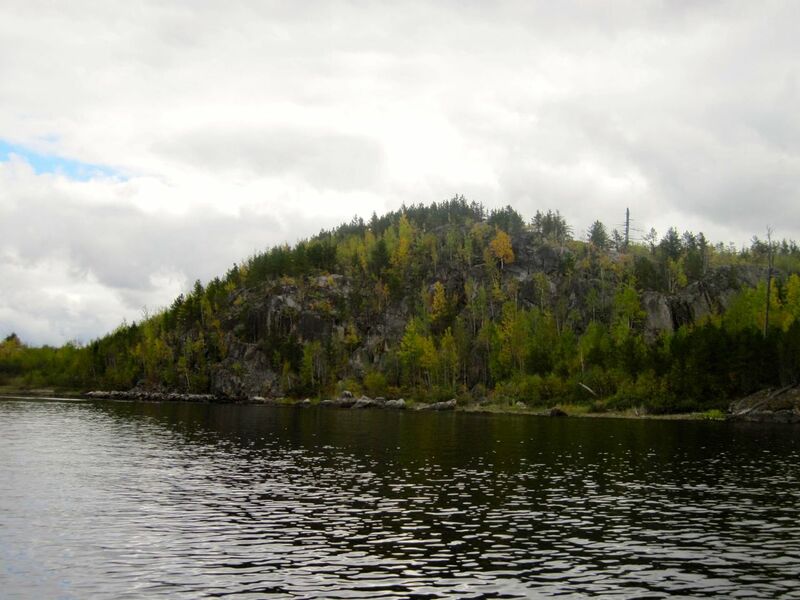 ), streams along the Agnes River, pictographs, islands, and cliffs during this part of our journey. And we did a lot of singing of voyageur songs and oldies! On our 4th day we stopped at Louisa Falls and were glad to be hiking up the steep, rocky, rooty trail without our canoes and gear. There the sun peaked out for the first time in a few days…it felt pretty glorious! Our campsite on Sunday Lake that night was one of our favorites. We’d fallen into a pattern of good rock time, cooking yummy meals and taking out the map to talk through our plans for the next day. And that night we watched the sky and lake for a long time. Over the next few days we looped south along the border and then northeast along the man chain. These lakes are very confusing to talk about… “Was that This Man or That Man? Is this This Man or That Man?” …but cliffy and island-y and calm. In addition to large “Welcome to Canada” signs, we experienced lilypads and knee-deep mud during this part of the journey. It was all very wonderful! The last few nights of our trip were cold and brought beautiful misty mornings. On our final morning in the Quetico we paddled through Ottertrack Lake in awe as the mist revealed perfectly still water and cliffs brightened by elegant sunburst lichen. It was hard to leave this beautiful place experienced with beautiful friends. But Quetico, we will be back!! They did the route in 7 days but be warned, these girls move! Moving 15 to 20 miles a day is not unheard of for them.